We've worked hard to craft a space to enjoy, sip, and shop while we clean your car! Our curated Gleam Shop is sourced almost entirely from local Denver small businesses, and we're always working to add new vendors to our list! From Denver's Novo Coffee to Happy Leaf Kombucha and Fruitivity Apple Chips, we have a wide selection of drinks and snacks from all around Colorado. Gleam Shop's snacks and drinks are 100% locally-sourced! 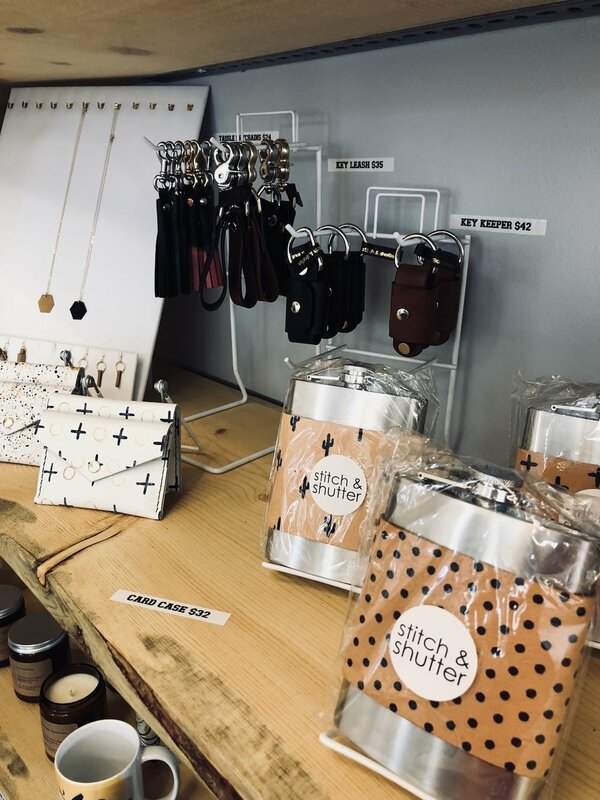 We have many local goods for you to choose from including leather wallets, candles, mugs, and even something for your furry friends. And if you fall in love with a product – the maker might even be your neighbor. The majority of these goods are sourced locally in Denver. On your way to a birthday, baby shower, wedding, or other special occasion? Take a moment at the Gleam Shop to flip through our two floor-to-ceiling card walls and find the perfect card for you!